Blue Lace Agate can also be used on the Third Eye to soothe an overactive mind and to still one's thoughts. [Ahsian, 7] The Third Eye, or Brow Chakra, is the center of perception and command. It directs our sight and everyday awareness of the world. Our consciousness is located here. If your birthday falls in any of the following periods, a Blue Lace Agate can be a valuable conduit to your Guardian Angel. The table also provides the name of the Guardian Angel of those born in the time period. There are other Angels that are partial to Blue Lace Agate. The table below gives you the information about them. Blue Lace Agate is dedicated to Nerthus, the Norse/Germanic Earth Goddess of Fertility, and Hanwi, The Sioux Moon Goddess. Her name means "Night Sun" and she guards her people during the night, protecting them from harm and from evil spirits. All Agates honor Aurora, Roman Goddess of the Dawn and Mother of the Winds. She brings the beauty of dawn each day, the vivid colors streaked and swirled across the clouds. All Agates honor Bona Dea, the Roman Earth Goddess of Fertility and the Greek Goddess of Women. She protects women through all of their changes, and is a skilled healer, particularly with herbs. All Agates honor Gaia, the Greek Earth Mother Goddess. Born directly out of Chaos, the primal emptiness, she was the first (or one of the first) beings to appear during the process of creation, and is honored as being the Earth itself. All Agates honor Cerridwen, the Welsh Goddess of Inspiration and Knowledge. She rules the gifts of prophecy and magic, and powers death and rebirth. She is the guardian of spiritual transformation. All Agates honor Nyx, the Greek Goddess of the Night. She is usually seen riding in a chariot, trailing stars and painting the night sky. Agate is strongly associated with Nyx because of its properties to protect against stress and for keeping bad dreams away. Blue Lace Agate can also can be used in devotions to Clota, the Goddess of the River Cldye; Callisto, the Greek Moon Goddess; Chirakan-Ixmucane, the Mayan Creator Goddess; Dione, Phoenician Earth Goddess; Itzpapaloti, the Aztec Butterfly Goddess; and Jana, the Roman Goddess of Secret and Hidden Things. Blue Lace Agate is not a traditional birthstone. Blue Lace Agate Natural Birthstone. With their beautiful light blue color, these stones are some of the natural birthstones of those born while the world awaits the vernal equinox and spring (February 19 - March 19). This is a time when new life is about to burst forth, a time of faith and trust. Blue crystals bring you patience and respect. Agate is one of the zodiac stones for those born under the sign Gemini, between May 21 and June 20, when the Earth is approaching summer. The constellation Gemini is known as the Sign of the Inventor and is seen as twins side by side in the sky. It is closely associated with the planet Mercury. Those born under this sign can see both sides of an issue. They're flexible and can go with the flow, and can be lively and talkative, or restless and nervous depending on their setting. Those born when the Sun is in Gemini are quick thinkers, quick-witted, and quick on their feet. Blue Lace Agates are Seeker Transfomer crystals. Seekers contain the crystal energy structure that aligns the natural energy of the crystal to the natural power of the human mind to find the way to new horizons and new capabilities. They're pointers, directors, and compasses; the fresh start crystals. These are talismans of the scientist, the adventurer, the hunter, wanderer, and explorer. They're also crystals of the student and the researcher. 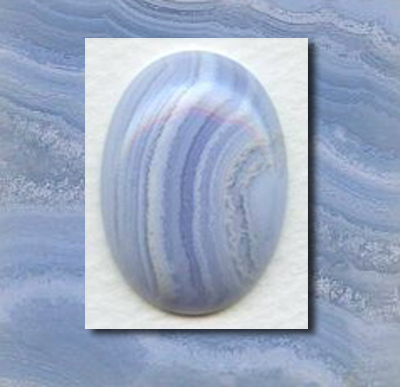 Blue Lace Agate utilizes Water energy, the energy of stillness, quiet strength, and purification. It embodies potentialities unrealized. It is yielding, formless, yet powerful. The Water element brings power of regeneration and rebirth. It is the energy of the circle of life. Use blue crystals to enhance any space that you use for repose, calm reflection, or prayer. Water energy is traditionally associated with the North area of a home or room. It is associated with the Career and Life Path area, its flowing energy assuring a balance of energy as your life unfolds and flows.